Criterion Barrels, Sharps Bros, and Rifle Dynamics have teamed up in an attempt to stretch the accuracy potential and maximum effective range of the AK rifle platform to its limit. This prototype rifle features a hand lapped 18″ 416R stainless steel salt bath nitrided Criterion barrel chambered in 6.5 Grendel. The selection of the 6.5 Grendel cartridge allows for straightforward compatiblity with pre-existing 7.62×39 components utilizing loads that allow for a much higher ballistic coefficient. These rifles are built around a variant of the Sharps Bros MB47 receiver designed to accept 6.5 Grendel Vepr magazines. Other components on this demo rifle include an SLR Rifleworks handguard, and Leupold Optics glass affixed by a Sabrewerks Kalashnikov Optics Platform (KOP) mount. The bolt carrier group is identical to a standard 7.62×39 rifle configuration. 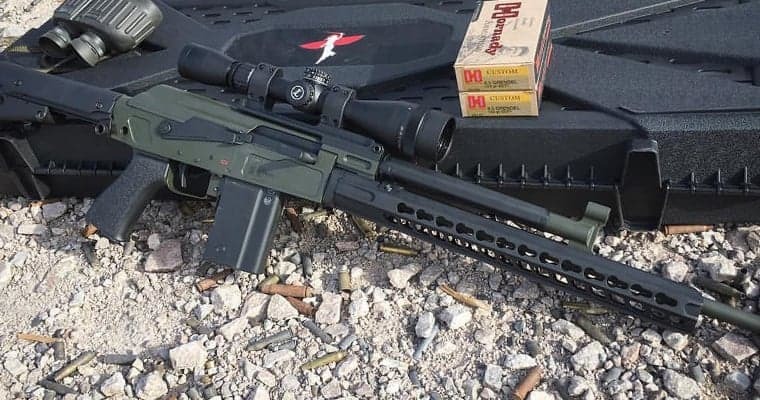 Sharps Bros and Rifle Dynamics intend to test this rifle at long range using a custom Hornady 123 SST load that should remain supersonic out past 1,000 yards. Upon successful testing of this prototype build, Sharps Bros will be the primary distributor of receivers and barrels for this rifle platform. These demo rifles will be on display during SHOT Show at the Rifle Dynamics open house on January 18th at their Las Vegas production facility. Please contact Sharps Bros for information pertaining to this new rifle design. This entry was posted in Articles, Industry Partner News, New Product Announcements, News. Bookmark the permalink.